1 Melt Spread in a large non-stick skillet over medium-high heat and cook shrimp and chorizo, stirring occasionally, 3 minutes or until shrimp just turn pink. Remove shrimp and chorizo; keep warm. 2 Cook red peppers in same skillet, stirring occasionally, 3 minutes or until beginning to soften. Stir in water and milk and bring to a boil over high heat. Stir in Knorr® Italian Sides™ - Alfredo, reduce heat to low and simmer covered 7 minutes. 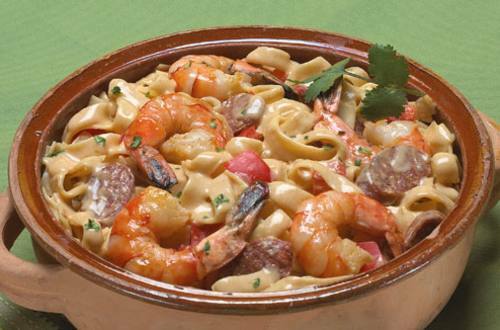 Return shrimp and chorizo to skillet and cook 1 minute or until noodles are tender. Let stand 2 minutes. To serve, garnish with cilantro.